The definition of circulation as it applies to businesses is the proliferation of several things, including brand, products, services, and business reputation. The actual act of business circulation is usually performed by a highly trained sales and marketing group within the business. 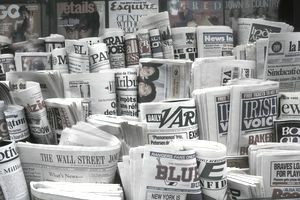 Study the example of newspapers to identify circulation in business. Circulation is their biggest issue, and it's the full scope of their daily business operations. In other businesses, circulation is identified by the scope of density within target markets. Considerations regarding circulation depend on the particular scope of each business. If the central scope is a product, circulation of the product to the most beneficial target markets is critical. Circulation of a service is the primary goal of service-oriented businesses. Medical, legal and accounting businesses offer services that attract a wider circulation because it's so necessary for people — the prospective clients and targets — to resolve health, legal or accounting issues they may have. The chief purpose of circulation is to expand a business, increase its clientele and broaden interest in its products or services. It can be accomplished through the use of online and offline advertising and promotion. A key factor in the success of circulation is the link between advertising and promotion. Differences exist in types of circulation as a result of business identity. A major grocer knows the importance of daily circulation of sales events, while a small parts manufacturer may require less frequent circulation of its product line. Timing, target markets and the type of circulation chosen play a major role in the success of all sales and marketing campaigns. Implementing circulation prototypes into business is a matter of planning and a design that is most complimentary to products and services. The plan for circulation begins with indexing of the most advantageous sales areas. Marketing professionals provide in-depth information on actual and projected sales territories. When these territories are clearly outlined and defined, it becomes the domain of sales management to design the central operatives of circulation for each salesperson. It can include business product or service portfolios and presentations, or trade events and local proliferation of promotional materials. Don't overlook introductory presentations to new clients and taking steps to re-establish your business relationships with existing clients. With well-planned and design circulation, results are always a key factor in making necessary alterations to create a seamless "fit" for target markets. Avoid over-saturation of circulation. Products and services remain evergreen when they're regularly refreshed with new additions. One example of this can be found in the fashion industry. Circulation of haute couture designer names is generally the result of fashion shows, but designers know the importance of refreshing their seasonal collections and circulating new designs to their largest customers, and ideally, this is accomplished in advance of the next fashion season.